Last Sunday night we gathered, we sung carols and we heard the ancient story of hope that comes to us from our Christian heritage. We gathered around the theme: Finding hope in a World of Darkness. On Monday morning we heard the surreal news of what was occurring in Sydney: hostages taken, fear, confusion, lives at risk. Darkness descended on our nation. Tragically this darkness deepened as we awoke on Tuesday to discover the lives of two of the hostages had been lost: Tori Johnson and Katrina Dawson. Our nation mourns with those who have lost their loved ones and we uphold them in our thoughts and prayers. Our prayers also continue for those injured both physically and mentally by this terrible ordeal, including not only the hostages but those police officers, officials, ambulance officers and hospital staff involved. Sadly, once again we see how devastating the actions of one disturbed person can be. A man who stands for nothing but the violence within him. In no way should we honour his misguided political or religious claims, he honoured no God, no state and no religion in his actions. I pray the reporting of the incident reflects this and does not give air space to the agendas of this individual, misguided as they were. As we all grapple with this loss of life and the infiltration of fear into the community it is heartening to see the response of a multitude of people around Australia and the world. The multi-faith prayer gatherings which began as the incident unfolded. The response to condemn the actions of the man by the Australian Islamic community has been decisive. And the amazing Twitter #illridewithyou response which has gone viral. As well as the olive ribbon campaign that shows a commitment of solidarity among those of different faiths. In the midst of the tragedy that has occurred this response is a reminder that the light shines in the darkness and the darkness did not overcome it. 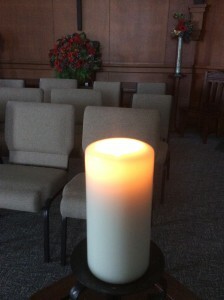 Today the Christ candle burns in our church as we pray for peace, salaam, shalom in our troubled and darkened world. We pray for comfort and for hope and for the knowing of God as love. This entry was posted in Uncategorized on 16/12/2014 by stlucia.master.